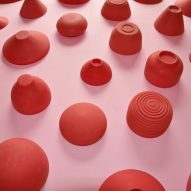 These silicone plates designed by Royal College of Art graduate Lina Saleh wobble and jiggle to influence how diners experience their dinner. 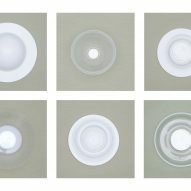 Saleh, who designed the tableware as part of the Design Products masters, created each plate to influence the perception of taste. According to her research, our experience of taste begins before we even start eating. 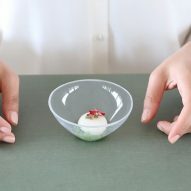 The collection of plates includes bowls that pop inside out, bouncing domes, saucers that can be folded in the hand and dishes that tremble as food is eaten from them. To design the plates, Saleh partnered with a chef, setting out to create responsive tableware that would tie to each recipe in some way. Saleh later broadened her remit, creating plates that could be used for a range of dishes. "The project started by trying to create a dish for dessert that would convey the heaviness and richness of it, even before tasting it," explained the designer. Saleh chose silicone for its flexibility. It could move and react to diners' touch while retaining a soft quality. She tested the plates through a series of different dinners, to make sure the silicone's gelatinous quality wasn't off-putting, and also experimented with the thickness of the material to create different effects. "They respond to touch, coming to life, thus changing our interaction with a plate," Saleh told Dezeen. "They add a new dimension to what plateware can achieve, thus changing our perception of it but also adding a new tool for a chef to express himself." 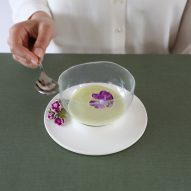 "I hope that these plates can help inspire chefs and challenge their plating abilities, but also enhance the experience of a diner by connecting him to an inanimate object that responds to his touch, giving a sense of enjoyment and surprise but mostly changing our views on what the future of plateware can be – no longer static but moving and responding, connecting to our food more." Japanese design studio Nendo also made the most of silicone's jelly-like consistency, for a set of super-thin vases that it immersed in an aquarium during Milan design week. Other graduate projects on display at this year's Royal College of Art (RCA) graduate exhibition include packaging designed for podcasts and a furniture manufacturing system that would combat waste. The exhibition is on from 24 June to 2 July at the RCA's Kensington campus in London.